Here we are! Today is the day! 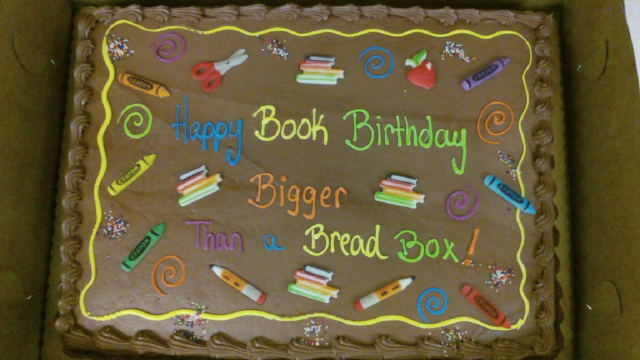 Bigger than a Bread Box is officially a book, out in the world, roaming free. Hopping trains and jumping puddles. But what I am really floored by is how my friends are celebrating with me. This AMAZING cake is being consumed by Mr. Sharpe’s class in Michigan. Here in Atlanta, we’re having a party on Friday at 7 pm, to celebrate. I will cry, and laugh, and drink some wine, and eat some snack cakes. You should come too! Now I am off to take a BAWTH, because that is not what I usually do at 10:09 on a Tuesday, so it seems a nice way to celebrate. I hope you like my book! This entry was posted on Tuesday, September 27th, 2011 at 8:10 am	and is filed under Blog. You can follow any responses to this entry through the RSS 2.0 feed. You can leave a response, or trackback from your own site.